52 Tavistock Square, which lies in the Bloomsbury district in the borough of Camden in London, was a very important location in the life of Virginia Woolf, who bought the property with her husband Leonard Woolf in early 1924. 52 Tavistock Square was her longest location of residence and where she did most of her writing. 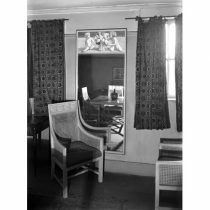 Inside, the house featured large murals personalized and painted by Woolf’s sister Vanessa Bell and brother-in-law Duncan Grant. Because of her return to London and her newfound life in the lively and vibrant neighborhood of Tavistock Square, Woolf was inspired to write a story of a woman walking throughout London. Thus, “Mrs. Dalloway” was conceived, written, and published here at 52 Tavistock Square, as Virginia and Leonard housed their printing press within their home. Hogarth Press, the printing press owned by Virginia and Leonard, her husband, was housed in the basement of the house. 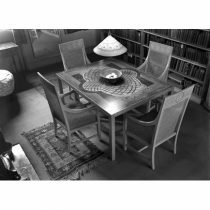 They utilized this press to publish many of Woolf’s works, such as _______ and published books for several other Bloomsbury’s, such as E.M. Forster, Sigmund Freud, and, most notably, this location is where the couple published T.S. Eliot’s “The Wasteland”. Virginia and Leonard moved from Tavistock Square in 1939 after purchasing nearby 37 Mecklenburg Square. 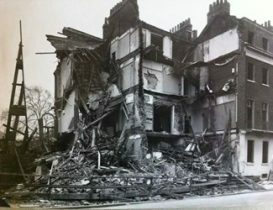 Shortly after moving, the London Blitz claimed the both properties over the course of two months, when nearly 200 German bombs fell over London and destroyed the Woolf’s Mecklenburg property in September 1940 and 52 Tavistock Square in October. After the damage to the home, the Hogarth Press was briefly relocated to Hertfordshire. Months later, on March 28th, 1941, Woolf committed suicide. The destruction of the property, due to its emotional meaning for Woolf, is thought to have contributed to her decision to take her own life. Many suggest that she feared for the impending war after losing something so close to her to warfare. 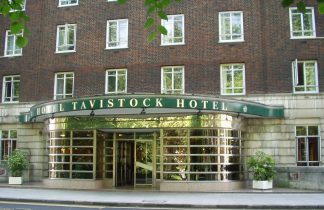 Obviously no longer standing, the site of the former 52 Tavistock Square is now home to the Tavistock Hotel, which was established in 1951, only ten years after Woolf’s residence was destroyed. 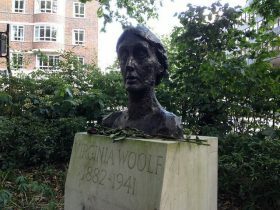 Today, in Tavistock Square, you will find a sculpture of Virginia Woolf, honoring the influence and significance she brought to the area. Londonist. “Virginia Woolf’s London.” Londonist, 16 Aug. 2014, londonist.com/2014/08/virginia-woolfs-london. “Virginia Woolf’s Homes Destroyed in the London Blitz.” The Virginia Woolf Blog, 3 May 2017, virginiawoolfblog.com/virginia-woolfs-london-homes-destroyed-by-german-bombs/. “Where Virginia Woolf Lived in London.” The Virginia Woolf Society of Great Britain, www.virginiawoolfsociety.co.uk/vw_res.london.htm. “Virginia Woolf Buys a House in Bloomsbury.” History.com, A&E Television Networks, www.history.com/this-day-in-history/virginia-woolf-buys-a-house-in-bloomsbury. “Buying Tavistock Square.” Blogging Woolf, 9 Jan. 2016, bloggingwoolf.wordpress.com/2016/01/09/buying-tavistock-square/. “The History of Hogarth Press.” Penguin Books, www.penguin.co.uk/articles/features/2017/jun/hogarth-100-history/. Copyright © 2019 Sites of British Modernism. Powered by WordPress and ThemeGrill.